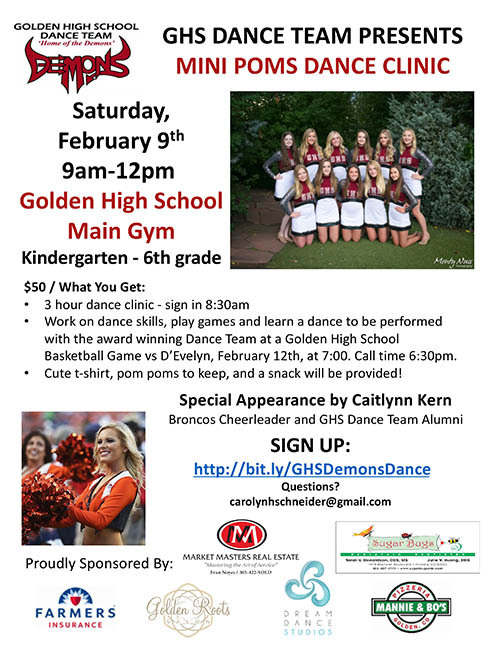 The GHS Dance Team will hold a Mini Poms Dance Clinic on Saturday, February 9 from 9 a.m. to 12 p.m. at the Golden High School Main Gym with a special appearance by Caitlynn Kern, Broncos cheerleader and GHS Dance Team alumni. This 3-hour dance clinic is for kids in Kindergarten though 6th Grade. Participants will work on dance skills, play games and learn a dance to be performed with the award-winning GHS Dance Team at a Golden High School Basketball game on February 12 at 7 p.m.